"Rules of Engagement - Part 1"
Superman finds himself split into a dozen plus pieces. His body has been displaced and sliced up by an approaching tesseract of mirror matter on a direct course for Earth. The new line-up of the JLA is in full swing as Batman and Atom coordinate from the Watch Tower, Superman, Jon Stewart and Faith try to slow the mirror matter's approach, and Flash and Fire Storm wait inside the tesseract formulating a way to transmute the mirror matter to something harmless. Just as Jon and Faith lose the grip on the mirror matter, Fire Storm completes the transformation. A reassembled Superman winds up and punches the new solid mass with all his might. The large mass explodes into a spew of Marshmallow matter. Flash can't help but be ammused. Later in the monitor womb Batman and Wonder Woman awkwardly set a date for them to work "things" out. But as they do the Watch Tower intercepts a communique from 50 light years away. It's a threat of war from one planet to another, a communication the JLA would never have recieved if not for annomillies caused by the mirror matter. Manitou presents his magical weapons to the Man of Steel in the meeting hall. He and his wife pledge their service to the JLA.... body and soul. The pledge makes for an embaressing moment as Big Blue searches for the words to diffuse the situation. Superman explains that while it's usually put up to a vote, he would be happy to have Manitou and his wife stay at the Watch Tower as guests and members of the JLA. Batman decodes the whole alien communication and discovers that an alliance of Alien worlds known as the Peacemakers are waging war on a foriegn planet in an effort to secure their allegance to the Peacemakers. When this news is brought to the rest of the League's attention, opinions are split right down the middle. Wonder Woman and Superman want to take a more proactive role in the conflict. Although it has nothing to do with them directly they feel that action now could prevent bloodshed later. Less cosmic members such as the Flash and Batman disagree. They feel that 50 light years away is too far out of JLA jurisdiction to warrant intervention. The lively democratic debate can't help but cause Manitou to smile. He has found a place in the universe among these great heroes of such strong moral character. Later on the planet Kylaq Superman, Wonder Woman, Jon Stewart, Faith, Manitou, and Major Disaster arrive just in time to deflect an army of Peacemakers forcing their way towards the planet's capital. The JLA make quick work of the invaders and then ship them off back to their fleet with their tails between their legs. The citizens of Kylaq are confused... The JLA has saved them today but left them open to attack later. Back on Earth Batman engages in a hostile conversation with a black ops general about the new JLA member Faith. It doesn't end well as the general turns to his associates and orders that "Manson" be contacted immedietly. Story - 5: Great story. The book opens with some much needed character interaction which completely justifies the new line up. There is a whole new dynamic established between the season veterans and the rookies. I'm especially coming to enjoy Manitou and his wife. And while I wasn't crazy about Faith at first, her "military girl" personality and diminutive nature work great. Who would expect the friendly girl in pajamas to be pro-preemptive strike? And the way Joe Kelly handles these larger then life heroes like Batman and Wonder Woman, guys who stare down gods and monsters but who still suffer the awkwardness of love and attraction, I can't help but smile when I read it. The crux of the issue is the impending war 50 light years away that the JLA technically have no bussiness being involved in. It's an intresting conundruum. This isn't the JLA's problem now, but it could be in a number of years. The lively debate that ensues juggles political, moral, and hypothetical topics in a responsible manner. All of the characters fall on the side of the arguement that makes sense to them, and me too. Everyone's opinion is routed in their personality, there are no wild declarations of war or outbursts to the contrary. Everyone remains in character, and when you're dealing with a group this large that's a tough thing for a writer to handle but again Joe pulls it off. Finally the surprise ending, while it didn't cause me any heart problems, was still a nice twist to an already intresting story. It added the nessessary super villian element to this politically charged tale. Art - 4: There is a nessessity in the first half of this issue that we get a real sense of movement during otherwise "banal" conversations. Mahnke does an excellent job of illustrating body language and facial expressions. Without the minor touches that Mahnke adds to each character's close up the conversations are in danger of becoming boring. But Mahnke excells at keeping these moments of character development as intresting as the blockbuster battles. 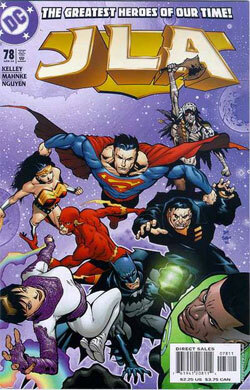 Speaking of which the JLA showdown with the Peacemakers was incrediblly well paced. It's clear that a lack of space in this issue forced the battle to be quick, but Mahnke plots it out in a manner that doesn't make it look too easy. The fight doesn't appear to be a token action scene just to show off a splash page. Cover Art - 3: Not that it isn't well drawn but I can't tell if they're supposed to be coming at you? or going up?